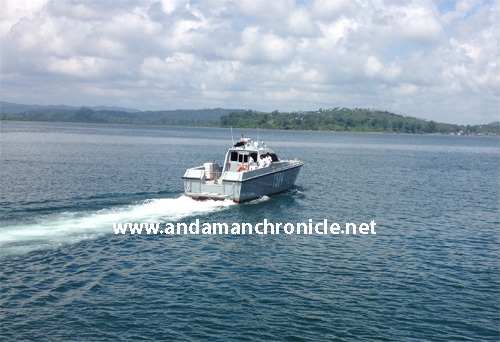 Port Blair, Oct. 31: Coastal Security in the Andaman and Nicobar Islands gets a fillip as the Indian Navy starts inducting fourteen Fast Interceptor Crafts (FICs). 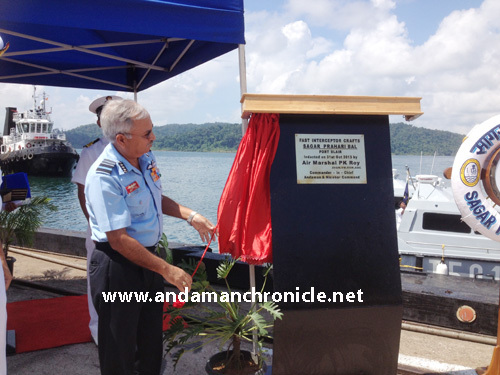 Air Marshal PK Roy, AVSM, VM, VSM, ADC Commander-In-Chief, Andaman & Nicobar Command today formally inducted four of these boats at Port Blair in an impressive ceremony. Speaking on the occasion the CINCAN Air Marshal PK Roy expressed confidence that the FICs would play a pivotal role in enhancing security in the islands. These fourteen boats are being inducted for enhancing maritime security across the Andaman and Nicobar Islands and are planned to be based at Port Blair, Diglipur, Kamorta and Campbell Bay. The FICs are manned by the Sagar Prahari Bal, which was raised in the aftermath of 26/11 Mumbai attack. The primary role of these crafts are to undertake scouting and support operations, provide maritime security to off-shore assets and escorts of high value assets. The FICs, manufactured by Solas Marine and manned by a crew of four are 16 meter long, made from glass fibre reinforced composites and are capable of attaining speeds up to 50 knots with and endurance of 200 nm. The vessels have excellent sea-keeping abilities and dynamic stability at high speed and can withstand high sea states. These state-of-art boats are water jet propelled and fitted with machine guns, night vision devises, communication equipment, automatic identification system (AIS) and radar besides carrying long range acoustic device (LARD). Infrastructure to man and support these crafts are also planned to be created at Port Blair, Diglipur, Kamorta and Campbell Bay. Timely capacity creation would go a long way towards comprehensive security through the length and breadth of the islands. Towards this ANC works in close co-ordination with the Andaman & Nicobar Administration. Interacting with the media, the CINCAN Air Marshal PK Roy said, the Command will soon be inducting the latest version of Mi-17 Helicopters into the Andaman Nicobar Command. The induction ceremony is likely to be held soon at the country’s southernmost tip, Campbell Bay in the Great Nicobar Island, the CINCAN added.